Looking for advice on natural health and wellbeing? Your local independent health store can offer a wealth of knowledge and expertise. 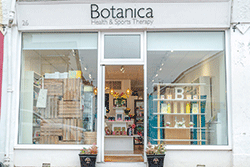 This month we speak to Naomi Murray, co-owner of Botanica Health in Tunbridge Wells. Spring is here. The bulbs are bursting into life, blossoms weigh heavy on the trees and the new season offers a bounty of spring herbs like the dandelion, nettle and wild garlic. While we welcome this new phase of the year in all its beauty, for many it hails the beginning of months of misery as allergies start causing symptoms that can continue right through until autumn. When you encounter an allergen, be it pollen, food or a dusty room, an antibody is produced, releasing histamine which causes itching, swelling and inflammation. Feeling permanently run-down, itchy eyes, runny nose, sneezing, flu-like symptoms, worsening asthma, irritability and tiredness are just some of the symptoms that sufferers experience. Quality of life is affected as the debilitating effects take their toll. Hay fever can start as early as February, with pollen from a variety of trees like the birch. The immune system can be constantly under attack throughout the summer and autumn months with grass, rapeseed and other triggers. It is therefore vital to strengthen and support the immune system as early as possible. The good news is you can reduce the potential of becoming plagued by seasonal allergies and reduce the severity of these symptoms with simple dietary changes and natural remedies. Hippocrates said: “Let food be thy medicine, and medicine be thy food,” and in the case of allergies you want to eat a diet that reduces inflammation and mucus and supports the immune system. Firstly, reduce or avoid milk and wheat products. Add a good source of natural probiotic food to your daily diet like kefir, kombucha or sauerkraut to support gut health. Consume foods and herbs rich in vitamin C such as lemons, oranges, yellow peppers, parsley, kale, lychees, strawberries, chillies and cherries. Eliminate foods that cause digestive disturbances and avoid processed foods. Eat foods rich in bromelain, an enzyme found in pineapple and papaya, which is particularly effective at reducing inflammation, allergies and pain. Lastly, eliminate inflammatory vegetable and sunflower oils, and instead use coconut oil, olive oil and butter. In terms of supplements, Unbelievable Health Bee Prepared Daily Defence is an all-in-one research-based supplement that can be taken daily for prevention and throughout the day if symptoms occur. It combines therapeutic quantities of natural immune-supportive nutrients like black elderberry, acerola cherry and olive leaf, all with a proven history of benefits. Nasal irrigation is an ancient Ayurvedic practice that can provide relief from allergic rhinitis, relieving nasal congestion and irritation. Warm sterile water is mixed with pure sea salt and added to a teapot-like vessel known as a neti pot. With your head tilted to the side, the spout is placed in the top nostril allowing the saline solution to drain through the bottom nostril. The University of California in San Diego studied more than 200 patients who used this procedure and found that subjects experienced “statistically significant improvements” in 23 out of 30 symptoms. Another natural remedy to try is nettle leaf, which is a natural anti-histamine and can be made into a tea. Wearing rubber gloves, collect fresh nettle leaves away from traffic fumes. Add to a teapot, cover with boiling water and leave to infuse for 10 minutes. Strain and drink with the addition of your favourite local honey. Ginger is well known for its anti-inflammatory action and a thumb-sized piece can be grated freshly into a cup, with the addition of honey and hot water. This can be topped up throughout the day. There are studies to show the link between stress and the severity of hay fever symptoms. Magnesium has been shown to reduce the symptoms of stress, such as anxiety and depression, as well as lower cortisol and reduce inflammation. The recommended RDA for an adult is around 300mg per day and can be taken in liquid, tablet, oil or spray form such as the BetterYou transdermal spray. On a final note, try to adopt activities that produce feelings of peace and relaxation to keep elevated stress hormones at bay. Practise mindfulness, deep breathing and spend time in uplifting company. Botanica Health was established in September 2011 by Naomi and Alan Murray. Naomi is a health and lifestyle advisor and Alan is a sports injury specialist. Naomi’s father is Scotland’s longest practising medical herbalist. The store specialises in herbs and minerals and has a team of therapists providing additional support to customers. To contact the store, visit www.botanicahealth.co.uk, email info@botanicahealth.co.uk or call 01892 458289.